March « 2014 « Geekorner-Geekulture. Another season is upon us (this week! ), so it’s time to look at what I’m going to watch, and what I’m expecting. Quite interesting to look at my expectations for Winter 2014 and how they panned out (poor Mahou Sensou and Nobunaga the Fool…). Most of the information about the shows can be had from RandomCuriosity’s page, the helpful Neregate Chart, and what I’ve happened to see on various sites, such as The Cart Driver. As always, organized by days of the week, because I might pick a show on an empty day or cut shows I enjoy on days already overfilled with other shows. Order is by expectation within that day. Originally I’ve listed every show I had some interest in, but that ended with 30 shows. After cutting some out, still had 22. Even if I don’t write anything about the shows, and even if I drop half by the time we’re 3 weeks in (which I never succeed at doing), that’s too much. There are quite a few shounen popcorn and RomComs shows this season, and most will likely be interchangeable, so need to pick 1-2 of each type, or wait for a few weeks in and hear which ones are better. Descriptions will be short, more on why I find them interesting. “Didn’t make it in” could also be seen as shows I might pick up after dropping others based on buzz. Break Blade – A drama about vying realms, with the monarchs having studied together as youth. Love and treachery, gallantry. A setting with fantasy mechs. I think this sounds very interesting. A version of 6 films adapting the same source material exists and had been on my plan to watch list for a while. Hadn’t watched it yet, so will try these. Interest Rating: 2/3. Quite intrigued, and if it turns out badly, can turn to the films. Write-ups: Could happen. Intrigue and drama, after all. Gokukoku no Brynhildr / Brynhildr in the Darkness – Made by the people behind Elfen Lied, both the manga author and the anime team, and that’s what most people decide whether to watch the show by. I thought Elfen Lied was “fine”, somewhere just ahead of mediocre. I didn’t hate it, and the premise seems interesting to me – a girl is supposed to be dead and comes back, played for drama and mystery. Yes, in the end premise is only the hook, and it’s all about execution, but it is what it is. Interest Rating: 1.5/3. Very cautious. But Sunday is still quite enough to permit it. Welp, this is the final episode, right? First things first, while this show had fights, it always purported to be more about community, about society. In this show fights had always been to make a point – that Nyanta, Shiroe and Naotsogu understand one another, that their control of the game is good enough to leave an enemy with just one hitpoint, that Crusty and the other adventurers are crazy berserkers… right? So, it doesn’t matter if the fight is physical or strategic, it’s all there to make a point. Shiroe is the main character in this show, and this is his fight (sorry, senpai! ), so we’re at the final episode, and we’re going to have a show-down! And yet, I don’t really think this story will be concluded here. This is about people’s lives, and they keep on going, and the wheels of diplomacy keep on turning. Finally, last episode’s preview, they’re really going to finish on a cliff-hanger, it feels like. Evil! Well, the Light Novels await, almost done with Mahouka. Shiroe is such a dork. 1) Three leaders of Log Horizon, one standing for the small guilds, one for the mercantile guilds, and one for the combat guilds. The decision-think tank is here. Time to get serious. Last episode had been fan-service oriented. It gave fans what they wanted, with the characters bonding and finally everyone being on the front page. Now it’s time for the final battle, as allies, as sisters, and yes, it’s also time for Fight Club Mako! 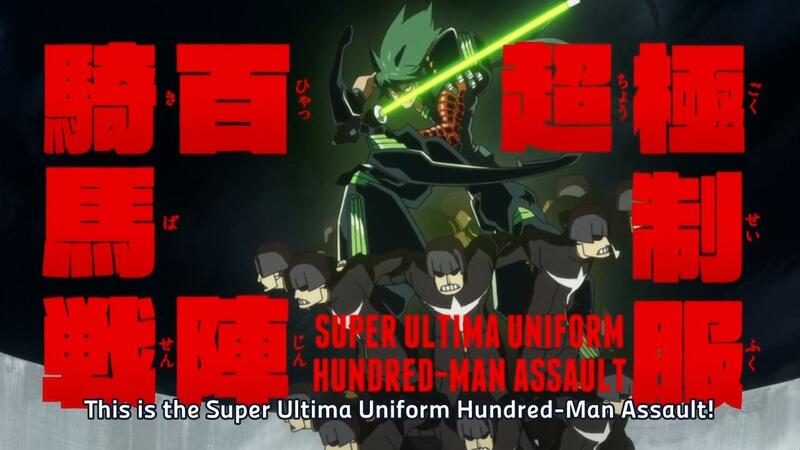 Sekai Seifuku / World Conquest Zvezda’s Plot Episode 10 – Homeless. Alone in the Cold. Last episode ended ominously, with Kate looking long and hard at Asuta before letting him go (an ominous phrasing on my part? Yes it is). Renge knows who Asuta is, and there’s an invisible wall between them. Yasu teaming up with White Falcon? The city being all torn up, or perhaps it had always been this way? The remark that they no longer have a home to return to, when the one theme this show had always pushed was that of having a home, of finding one, of creating one? 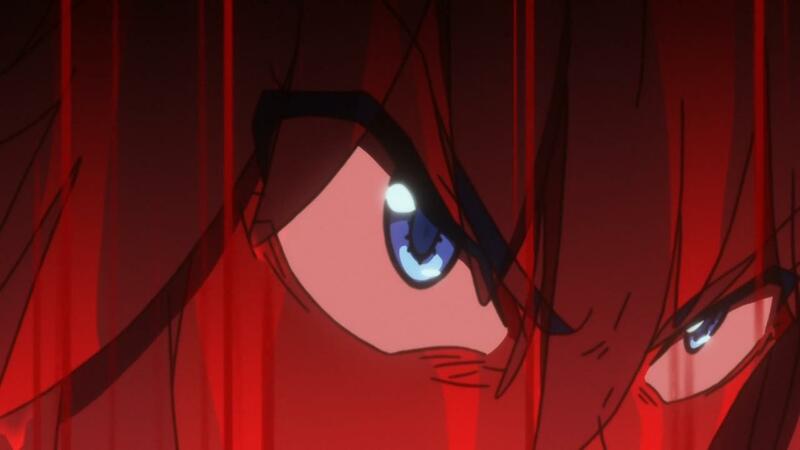 Kill la Kill Episode 22 Notes – Time for Some Traditional Shounen Friendship! Ryuuko was filled with self-disgust which progressed to self-hatred and sabotaging her own life, until the power of friendship and self-disgust that’s been too large to bear had brought her back. It’s now time for the two sisters to finally join forces. More interesting was Satsuki being revealed as not entirely honest, she says she will do anything to obtain her goals, including lying, and perhaps this too is such a lie. Well, let’s see what the two sisters can manage. 1) You’ve messed with the wrong girl, dude. Covered in her heart’s blood, fulfilling the theme of self-hatred, she had cut out her own heart, she had sacrificed herself, so she could become a noble warrior berserker once more.